Will Iraq Be Libya? Can the Shiite Militiamen Avoid Turning on Each Other? Iraq’s Shiite militias have been celebrated and criticised. Now, as differences in everything from weapons to leadership to loyalties become evident, tensions between the militias are rising. Last Saturday was the anniversary of senior Iraqi spiritual leader, Ali al-Sistani’s call to arms. The cleric, who is seen as the leader of Shiite Muslims in Iraq and further afield, called upon all Iraqis to take up arms and defend the country against the extremist group known as the Islamic State, which had just taken control of the northern city of Mosul. Since then the locals who did as al-Sistani asked have become the last bulwark against the approach of the Islamic State, or IS, group’s fighters. The volunteer militias are now known locally as the Hashd al-Shaabi, or Popular Mobilization Units, and have become both a cause for celebration – as they achieve victories and push the IS group back – and controversy, as they are accused of illegal acts of revenge, looting and generally taking the law into their own hands. The militias are mainly made up of Iraq’s Shiite Muslims and the IS group bases its ideology on a form of Sunni Islam – so the militias’ importance in the fight against the IS group has also become a source of sectarian tension inside the country. But the tensions do not just exist between Iraq’s Shiite and Sunni Muslims. As the Shiite militias become more powerful, tensions are also increasing within the group. They may have a common enemy and share a religious sect but these militias are far from united. Basically the Shiite militias are split along the same lines as opinions in the main Shiite Muslim political parties. And their disagreements are not just military, they are based on present and future economic and political power. 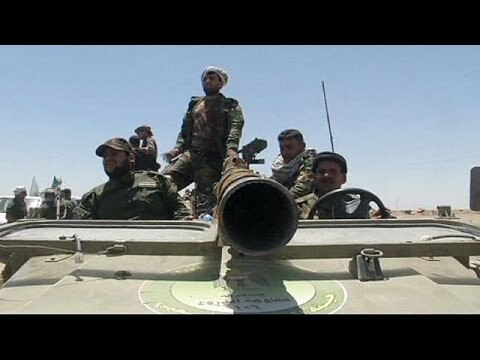 Today the Shiite Muslim militias fighting in Iraq can be split into three rough categories, all three of which are different in terms of their strengths and weaknesses, the weapons they possess, how they are funded and their potential to make military decisions, and whether those decisions are made independently of the Iraqi government or not. The first, and possibly best armed, category of Shiite militias includes those closer to Iran with religious links that favour Iran’s leading religious figure, the Grand Ayatollah Ali Khamenei. The most prominent in this category is the Badr organisation, the League of the Righteous, Hezbollah in Iraq, the Khorasani Brigades and Harakat al-Nujaba. These militias have the best weaponry and are often critical of the Iraqi government. The second category among the Shiite Muslim militias includes those who are more loyal to al-Sistani. These include the following: the Ali al-Akbar brigades, the Abbasiyah Shrine brigades, the Alawite Shrine brigades and the Husayniyah Shrine brigades. These militias are funded by al-Sistani himself and, unlike the first category, they don’t appear to have any overt political motivation. They have been put at the disposal of the Iraqi government and tasked with fighting the IS group, defending land that has been taken back from IS fighters and protecting locals. What is notable about these militias is their large number. However they only have light to medium weapons – things like Kalashnikov guns and other Soviet machine guns – and they use civilian 4WD vehicles to accompany the Iraqi army to battle. Al-Sistani’s office funds these militias from donations that the office receives from Shiite Muslims around the world, anonymous sources in the cleric’s office told NIQASH. Partially, the sources also noted, the intra-militia rivalry is also about the enduring struggle between senior religious figures in Iran and Iraq, with both offices vying to be considered the eminent theological authority for the world’s Shiite Muslims. “This is a historic struggle,” the insider said. Meanwhile the third category of Shiite militias are associated with two other major Shiite Muslim political parties with a religious bent. These are the Islamic Supreme Council of Iraq, or ISCI, which is led by a younger cleric, Ammar al-Hakim, and the Sadrist movement which is led by another cleric, Muqtada al-Sadr. Both of these parties have MPs in the current Parliament and a strong focus on political, as well as military leadership. This is a major difference between, say, the ISCI-affiliated militias and the Badr organisation, which was formerly associated with the ISCI and which, under Hadi al-Ameri, seems to be operating outside the official political sphere. Those militias associated with the ISCI include the Ashura Brigades and the Supporters of the Faith brigades. They are dependent on the Iraqi government for funding and weapons and abide by the central government’s decisions; they also often accompany official army units and have been known to use some of the Iraqi army’s equipment. The Peace Brigades, formerly known as the Mahdi Army, are affiliated with the Sadrist movement and depend on funding from the offices of Muqtada al-Sadr, who receives donations from his many supporters. This militia doesn’t get much money from the Iraqi government itself due, apparently, to ongoing internal fighting between the Sadrists and the government’s ruling Dawa party. Prime Minister Haider al-Abadi is a member of Dawa but so was former Prime Minister Nouri al-Maliki, who al-Sadr challenged seriously more than once during his tenure. In fact, a week ago al-Sadr called upon his supporters to send more funds for the Peace Brigades’ fighters and criticized the treatment of members of his militia, compared to treatment other militias received. For example, all government employees who volunteered to fight the IS group in a militia were given leave, with pay. However fighters from the Peace Brigades were not given the same privilege, even though many were also government employees, al-Saedi complained. The complaints from al-Saedi are just one small part of the increase in tension between the various factions within the Shiite militias. There’s been much more of this mudslinging, criticism and accusation seen and heard via media outlets owned by the various political and military groups. Previously the complaints were reserved for Iraq’s Sunni Muslims and Kurds, rather than for other Shiite groups. It has also spread beyond words. Last week in Basra, some locals demonstrated against the provincial governor, Majid al-Nasrawi. The governor is associated with the ISCI and thereby, also associated with the Sadrists. Politicians from the two parties say that their rival, the Dawa party, is behind these protests. Another recent incident involved Hezbollah in Iraq members attacking the ISCI headquarters in Basra. The ISCI has asked the head of Hezbollah in Iraq, Abu Mahdi al-Mohandes, for an explanation. While relatively superficial as yet, all of the above are indications of a potentially deeper and more serious rift within the Shiite Muslim bloc – and that rift could happen both in military and political terms as the various groups jockey for power. Analysts predict that this wrangling will worsen right up until the next round of provincial government elections, due to be held early 2017. At that stage, locals can only hope that the attentions – and weapons – of the Shiite militias will remain trained on the IS group, rather than those they consider rival militias.